...and within two weeks your check is emailed! Local Austin families that sell with JBF earn an average of $350 at each sale and so can YOU! Register to be a Consignor today and watch the Helpful Link videos below to get started! Join our consignor Facebook group to get tips & tricks from other consignors and ask questions if you need help on pricing, tagging or anything else! WE NEED YOUR HELP - earn more & shop first! 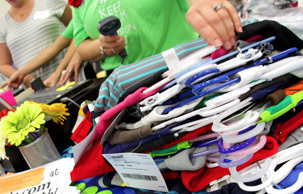 *All volunteers must consign at least 15 items. *No children allowed during volunteer shifts due to safety reasons. *You must be able to stand for longer than 4 hours, lift 20-35 lbs without concern of any medical conditions or injuries that may be affected and must commit to the full shift. Breakdown is a critical time to get the unsold items sorted - before consignors come to pick up, so we need LOTS of help. Anyone who works one 7 hour breakdown shift earns a 12 hour presale pass AND your consignor fee is waived! Prep, price and organize your stuff at home. Bring your items sorted by type and clothing size. Please plan on 30-90 minutes for drop off, depending on how many items you are selling. EXPRESS DROP OFF If you're in a hurry, we can help. You simply unload your vehicle and we do the rest. The cost for this service is $10 per 100 items. If you marked DONATE on your items, those will be pulled and donated on your behalf and you do NOT need to pick up. All items that are not picked up are donated to our charity partner by 7:01PM. Sorry, we cannot make exceptions due to limited time at the venue, so please be on time or plan in advance for someone to pick up your items for you and note this at drop off. 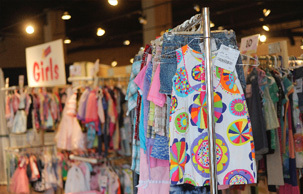 At JBF Austin Central, we have a "$3.00 Minimum Rule" on clothing. If your single, hanging clothing item is not of a $3.00 value on its own, please pair it with something that will bring the total for the items to at least this amount. You can pair two onesies together, for example. REMEMBER: Price to Sell! Generally that means 1/3 of the original retail price. Brand names and designer do well at JBF! 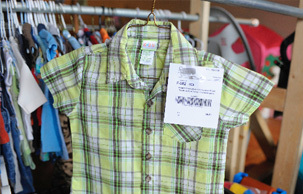 Tags MUST be in the upper right of all clothing items for easy shopping. Punch a hole at the top of the tag to make it easier to slide the safety pin through. *If you use a tagging gun please insert the gun in a tag/label or inside seam NOT through part of the clothing (to avoid making a hole or tear in the clothing). Also, pull on the tag to make sure it is properly secured and will not come off easily. If you are having trouble finding hangers ask co-workers, neighbors and friends for their dry cleaning hangers. Old Navy will often provide FREE hangers if you ask, as well as some dry cleaners you frequent. We will accept nursery & children's room furniture. Sorry we will no longer accept household décor – only children’s room decor. Furniture sells really well. All kinds of children's and juvenile furniture will be accepted. To keep our reputation of 'only the best', JBF asks that you be very selective about the quality of your furniture. All furniture must be intact and sturdy. Must be in excellent condition and not out of date. All Season of maternity clothing will be allowed at our sales. Please do not bring out-dated maternity clothes. They just will not sell - especially in Austin with our fashion savvy moms! Shoes with dirt or mud can not be accepted. Must be tied in pairs by shoelaces or put the shoes in a clear baggie. Laces and shoes must be in excellent condition. Be PICKY on shoes! Would you buy a worn out pair? All toys must be in working order, BATTERIES INCLUDED. Infant equipment includes car seats, strollers, high chairs, swings, exersaucers, bouncy seats, boppies, play gyms, pack & plays and bassinets. Event closes promptly at 7PM. IMPORTANT For safety purposes, no children, strollers or wagons allowed at any PRESALE aside from infants carried by you or in a sling / carrier. PENDING AVAILABILITY - please email Joy to inquire about this service. Got the STUFF, but don't have the TIME to tag?! We designed our VIP Consigning Service with you in mind. Click here to complete the VIP Consignor Registration & Waiver. Children: Children & strollers are welcome during public sale days on Friday & Saturday. Only infants under the age of 1 who are carried or worn will be allowed at any presale. Sorry, no children allowed while you are helping at the sale. Strollers, wagons, and infant carrier car seats are not allowed during Pre-Sale on Thursday. We will have complimentary bags for you to use while you shop and you will have the option to buy a reusable JBF bag to carry your items out for $5 per bag. It is recommended to bring a laundry basket or shopping bag for your purchases so we can reduce bag use! Shop til you drop: We will have a hold area for full bags so you don't have to carry them. Large items can be purchased by pulling off the bottom part of the yellow claim ticket and taking it to the register. If the bottom part is already removd, then you can assume it has been purchased. Forms of Payment: We accept cash or credit card; Visa, Mastercard, Discover, and AMEX. Sorry, no checks or money orders are accepted. Clean out your house and support the Austin community!